Crabby snacks and homemades: Recipes for Silver Linings Playbook fans. I wasn’t crazy about Silver Linings Playbook (in part because of its depiction of crazy), and I’m a bit baffled by all the accolades it’s received. Did this disjointed rom-com really deserve Oscar nominations in every acting category? Sure, Jennifer Lawrence would be riveting reading the back of a cereal box, but Bradley Cooper struggled to seem naturalistic, while Robert De Niro played Robert De Niro. Crabby snacks and homemades should be at the top of discerning Oscar fans’ party menus this year: Nominees rarely provide such straightforward recipe suggestions, so this is a rare treat that should not be passed up. (Usually we’re left to our own devices, leading to menu items like The Squids Are All Right, the Harvey WALL-E-Banger, and Brie of Life.) But those of us who were not raised in Philly must first make a determination: What are crabby snacks and homemades? Weaver has forgotten, but the Internet has not. 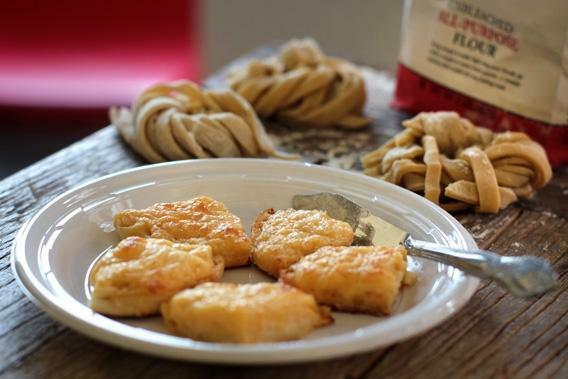 Crabby snacks are, to quote the Matthew Quick novel on which Silver Linings Playbook was adapted, “buttered crabmeat and orange cheese on English muffins.” Homemades are homemade egg pasta. The juxtaposition of these two recipes in Silver Linings Playbook’s script echoes the tonal confusion of the film: Where crabby snacks are lowbrow, convenient, and highly processed, homemades are old-world, labor intensive, and (as the name suggests) made from scratch. Serving them together makes about as much sense as culminating a film about mental illness with a wager on a dance competition made by someone with a gambling problem. And yet here we are. Crabby snacks sometimes go by other names, like “crab bites,” “crabby bites,” or simply “crabbies.” When I was growing up, they were a staple at my aunt and uncle’s annual holiday party, where they were known as “crab canapés.” That accent aigu made me think they were sophisticated fare, but learning otherwise upon reaching maturity didn’t dampen my enthusiasm for eating them. Making them myself for the first time almost did. The core ingredients of crabby snacks—softened butter, mayonnaise, canned crabmeat, and (crucially) Kraft Old English cheese spread—don’t look particularly appetizing when you dump them all in a bowl together. Making pasta from scratch requires another kind of perseverance. First, you must break eggs into a well of flour and beat them without letting them erupt over the sides of the flour like an elementary-school baking-soda volcano. Then you must knead the pasta dough, which is quite a bit stiffer and less pliable than bread dough. It takes a lot of kneading to bring it together into a smooth ball. Don’t despair; it will get there eventually. Finally, you must roll out the pasta dough, another time-consuming—though not necessarily boring—task. A crank-operated or electric pasta machine (or stand-mixer attachment) will easily flatten your dough into ever-thinner sheets and then cut it into even strands in one fell swoop. But you can also roll out pasta dough with a rolling pin and cut it into strips with a chef’s knife, a process that’s surprisingly satisfying. Crabby snacks and homemades are odd bedfellows, but happily they’re both quite flexible when it comes to timing. Crab-coated English muffins should be frozen for at least half an hour to make them more manageable before you cut them into canapés, but you can keep them in the freezer for even longer than that before you broil them. The pasta dough also needs about half an hour resting time before you roll it out, but after cutting the pasta, you can spread the strands on baking sheets (or twist them into bundles, as in the picture above) and let them dry at room temperature for up to a few hours. The longer you let them dry, the longer they’ll need to cook—but you’re looking at 10 minutes’ boiling time, tops. The flexibility of both recipes will leave you plenty of time to plan and execute the rest of your Oscar menu, including sauce for the homemades—if you don’t go the straight butter-and-Parmesan route, may I suggest vodka sauce or pesto?—as well as your Zero Dark Dirty Martinis and Life of Chocolate Pie. 1. Put the butter, crabmeat, cheese spread, mayonnaise, and garlic powder in a medium bowl; stir to combine. Spread the crab mixture on the English muffin halves. Freeze for 30 minutes. 2. Heat the broiler. Cut each English muffin half into quarters. Transfer the canapés to a baking sheet, and broil until browned and bubbly, about 5 minutes. Serve warm or at room temperature. 1. Combine the flour and salt in a large, flat-bottomed bowl. Form the flour into a mound and form a well in the center of the mound. Crack the eggs into the well. Beat the eggs with a fork, gradually incorporating the flour and being careful not to break the walls of the well. After about ⅓ of the flour is incorporated into the eggs, add the olive oil and ¼ cup water. Continue beating the egg mixture until a dough forms. Knead until all the flour has been incorporated and the dough is smooth and elastic, about 10 minutes, adding more water if the dough is too stiff to knead or more flour if the dough is sticky, about 1 tablespoon at a time. Cover the bowl with foil or plastic wrap and let the dough rest for 20 minutes. 2. Bring a large pot of water to a boil and salt it. Meanwhile, cut the dough into 4 equal pieces and roll each piece into a thin rectangle with a pasta machine or rolling pin. Cut each rectangle into thin strips with a pasta machine; or, starting from one of the short sides, roll each rectangle up and cut it into thin strips with a knife. Boil the pasta until al dente, 2 to 3 minutes, then drain and serve.